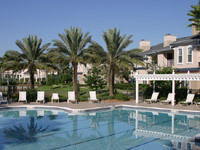 They are offering a special of one month free on a unit overlooking the pool at this community. The special is only available through the end of the month. No aggressive breeds, $350.00 Pet Fee for 1 pet, $550 for 2 pets.